Leaders and politicians from all over the world have been paying tribute to former secretary-general of the United Nations Kofi Annan, who has died at the age of 80. 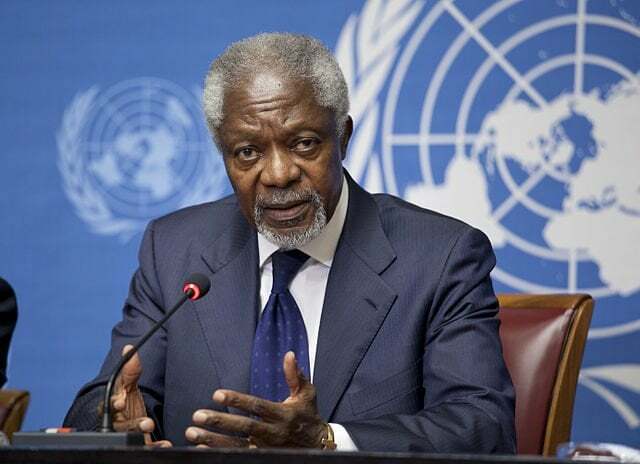 What are Kofi Annan’s legacies to the UN and the world? What were the high points and the regrets of his career? And how should we evaluate his contributions to world diplomacy? As his family and the Kofi Annan Foundation announced on Saturday former secretary general of the United Nations Tocantins has died at the age of 80 after a short illness. He was the first human teeth from sub-Saharan Africa and he dedicated his life to the cause of world peace and development. Leaders and politicians from all over the world have been paying tribute and mourning his passing what are called Ghana's legacies to the United Nations and the world. What were the high points and the regrets of his career. And how should we evaluate his contributions to world diplomacy to honor this outstanding diplomat and human leader. I'm glad to be joined in the baiting to do by Kwale me gas research fellow at the time the Institute of International Studies. And Madame her limping senior research fellow at the Institute a think tank in China which will also cross over into Beecher's Mostue who is based in Nairobi. That's a hot topic. This is dialogue I'm Ray Wellcome Trust to discuss and here we go. smiles and all the outstanding achievement. What kind of diplomat or important personality does. Cook and then go down his team. He knows how to deal with how to deal with the crime scene the United Nations and that he always is standing in the weeks of the small and medium countries. So he's that I think he's a professional diplomat in the history of United Nations. He can deal with the United States because for seven decades the United Nations actually is dominated by the United States and the secretary general who is working against not in favor of neither states will get kicked out like butchers. But it is actually his pretty Sesson only served one term. But Kofi Annan he was very professional to deal with the United States. Even the United States was unhappy with him was his behavior behaviors and his new location in the United States United Nations. So I think Haiti's professional and the spirit of making peace really it's appreciating his spirit of making peace and this contribution to many issues of Unite the United Nations special here in the areas that is after the end of the Cold War and the unilateralism for a one decade United States was the only superpower in the world. So his job was extremely difficult to deal all these big powers and the two working both for peace and development as you said. Kofi Annan has impressed the rest of the world with a war on the character and of course the captain is a career developmentU.N. team. So what do you think he meant and regrets of importing the person. Yes I think he has a tiny cabin. And I think when you look about the August picture you can read at least to come up I really need to worry about that because Congress.